Scattered throughout coastal waters and left silent and still in the places where they fell, these derelict vessels are relics of wars, battles, disasters, and other shipwrecks from the past. Aged by time and the impacts of a watery grave, these vessels continue to decay and corrode. As their once strong and impenetrable exteriors break down and give way to the forces of the sea, their fuel tanks weaken. Oil and other toxic chemicals begin to rise up from the graveyard below like a phantom ascending a staircase. 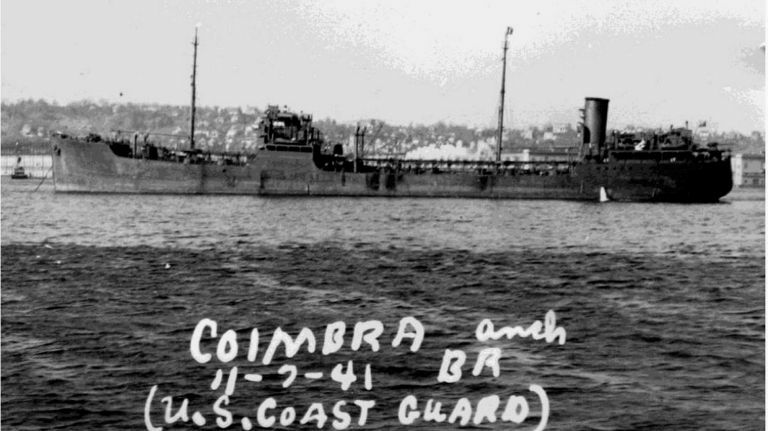 One such vessel — the doomed Coimbra tanker — met its fate on Jan. 15, 1942 near Long Island, New York. A British steam tanker during World War II, the Coimbra was torpedoed and sunk by a German U-boat in the Battle of the Atlantic. As the vessel plunged to its final resting place approximately 20 miles south of the Shinnecock Inlet, it carried with it an estimated 2.7 million gallons of oil. Most of the oil on board is thought to have spilled or burned immediately following the incident, yet some still remained. Over the years, divers have reported seeing sheens coming from the site of the Coimbra. Though it wasn’t until Oct. 15, 2009 — when the East Hampton Star reported that a recreational diver had surfaced covered with oil after diving on the tanker — that scientists suspected the leakage may be getting worse. At the time, OR&R’s Emergency Response Division was developing an interagency agreement with the U.S. Coast Guard under which the agencies would work together to address threats from vessels sunk off U.S. shores that contain significant volumes of oil. In 2010, Congress appropriated $1 million to NOAA to prioritize the potential pollution impacts of individual shipwrecks. Under this project, known as the Remediation of Underwater Legacy Environmental Threats (RULET), NOAA and the U.S. Coast Guard set out to identify the most ecologically and economically significant potentially polluting wrecks in U.S. waters. The agencies began by looking into about 20,000 known shipwrecks. They narrowed their search down by the age of the vessel and the incident, the type of vessel, and the circumstances that led to the vessel’s demise. 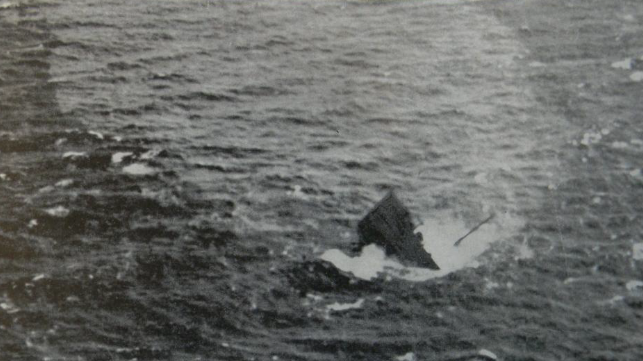 World War II wrecks, especially tankers like the Coimbra, were prioritized for their large cargo volumes. The results of the study produced a database of the names and locations of the most potentially environmentally hazardous wrecks — zoning in on 87 high level risk wrecks. Those sites are routinely monitored by the NOAA Satellite and Information Service Satellite Analysis Branch using high resolution visible satellite imagery and Synthetic Aperture Radar. Satellite observations are an ideal method for surveillance, as several of the shipwreck sites are well offshore and possibly out of range for routine overflights. For every satellite detection of an anomaly associated with a RULET wreck, a Marine Pollution Surveillance Report (MPSR) is generated and disseminated to responders in NOAA’s Office of Response and Restoration, the U.S. Coast Guard, and others. Analysis is predominantly conducted using free-source publicly funded environmental data, and reports are produced in a 24/7 operational setting to ensure the information can be acted upon (if need be) in a timely manner. The reports serve as documentation of a chronic release, and also provide the spatial extent of the pollution that reaches the surface. Discharge rates can change over time due to continued degradation of the fuel tank, or after the passage of a tropical cyclone, etc., and so it’s critical to continue to monitor and report on the oil releases even though they’re well known. The number of report issuances for a given wreck can also aid responders in the decision making process, by helping prioritize the order in which the ships are scheduled to have their oil cargo removed, or possibly have the vessel extracted altogether, both of which can be dangerous and costly. 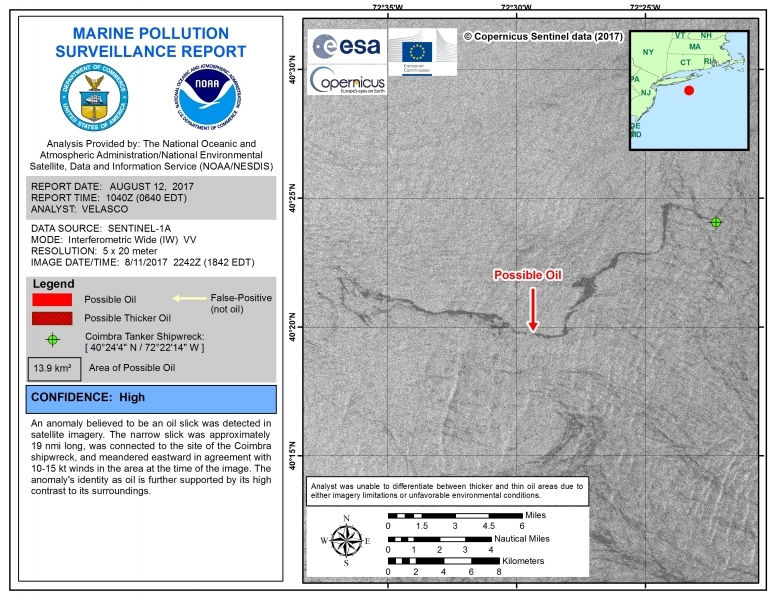 A Marine Pollution Surveillance Report from Aug. 12, 2017 showing possible oil near the site of the Coimbra. Image credit: NOAA. The surface expression of oil is not always present, but depends largely on underwater currents and surface wind speed. Conversely, there are times when oil is present, but not detectable due to unfavorable environmental conditions or limitations in the satellite sensor. For example, SAR imagery cannot detect surface slicks in low wind conditions, 5 knots or less, or high wind conditions, exceeding 15 knots, and visible imagery cannot “see” the surface of the ocean through weather clouds or in poor illumination conditions. The combined satellite in-view opportunity for any given wreck is approximately two to five times per month. When it becomes apparent that an oil release has started, or an ongoing release has been discovered, responders consider the option to remove the oil. To remove oil from a vessel underwater requires a process called “hot tapping,” in which divers drill into the ship using special equipment designed to handle the displacement of liquids and other underwater complications. The oil and other fluids are often located throughout different compartments, making response challenging and requiring divers to drill at multiple points. In the case of the Coimbra, NESDIS continues to monitor for oil and has issued 17 satellite reports within the calendar year. These reports serve as documentation of the lingering environmental threats stemming from an event from more than three-quarters of a century ago. In June 2018, the Coast Guard announced that it would contract and oversee an underwater assessment of the condition of the vessel, which is scheduled to take place in the spring of 2019. Click on the slideshow below to see several of the other potentially polluting shipwrecks being monitored. The Joseph M. Cudahy was a 430-foot-long tanker built in 1921. The Joseph M. Cudahy is located approximately 120 kilometers northwest of Key West, FL. It’s an American Steam Tanker that was also torpedoed by a German U-boat on May 5, 1942. Image credit: U.S. Coast Guard. 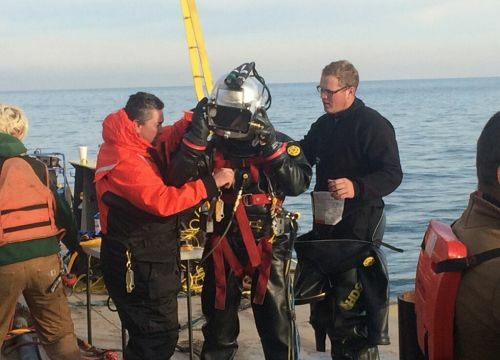 A diver, wearing a positive pressure dive suit, is inspected by his coworkers prior to conducting dive operations for the Argo response in Lake Erie, Nov. 24, 2015. The tank barge Argo, which sank in 1937, was identified as a potential pollution risk in 2013. At the time of the sinking, the barge was reportedly loaded with 4,762 barrels of crude oil and the chemical benzol. Divers conducting operations during the Argo response are required to wear specialized dive suits designed for the utmost safety to the diver while ensuring flexibility, ease of decontamination, and chemical resistance. Image credit: U.S. Coast Guard. 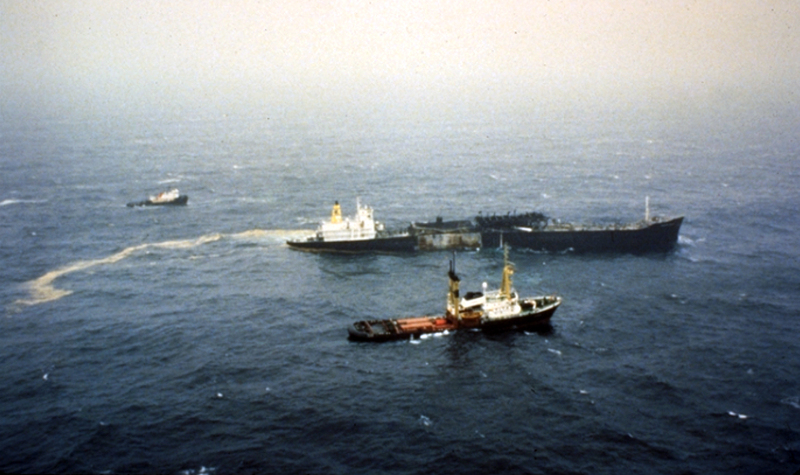 The Puerto Rican sinking on Nov. 3, 1984. The Puerto Rican was a modern steal tanker that arrived in the San Francisco Bay on Oct. 25. The ship departed for sea on Oct. 31, bound for New Orleans, after loading a cargo of 3,863,328 gallons of lubrication oil and additives and 357,000 gallons of bunker fuel. An explosion occurred near one of the tanks as the vessel moved just passed the San Francisco Bay Entrance Channel. The U.S. Coast Guard towed the burning tanker further out to sea in order to minimize the chance of a disastrous oil spill on the sensitive areas of San Francisco Bay, the adjacent ocean shoreline, and what is now the Greater Farallones National Marine Sanctuary. The Puerto Rican currently sits at a depth of 1,148 feet and was first surveyed by the U.S. Geological Survey in 1985 using a side-scan sonar. In 2011, the NOAA R/V Okeanos Explorer conducted a multi beam sonar survey of the wreck site. Image credit: U.S. Coast Guard. This vessel, believed to be the S.S. William Beaumont, sunk in 1971 off Sabine Pass, Texas. The oil was removed in 2009. The MV Fernstream collided with the S.S. Hawaiian Rancher on Dec. 11, 1952 in the San Francisco Bay during foggy conditions. 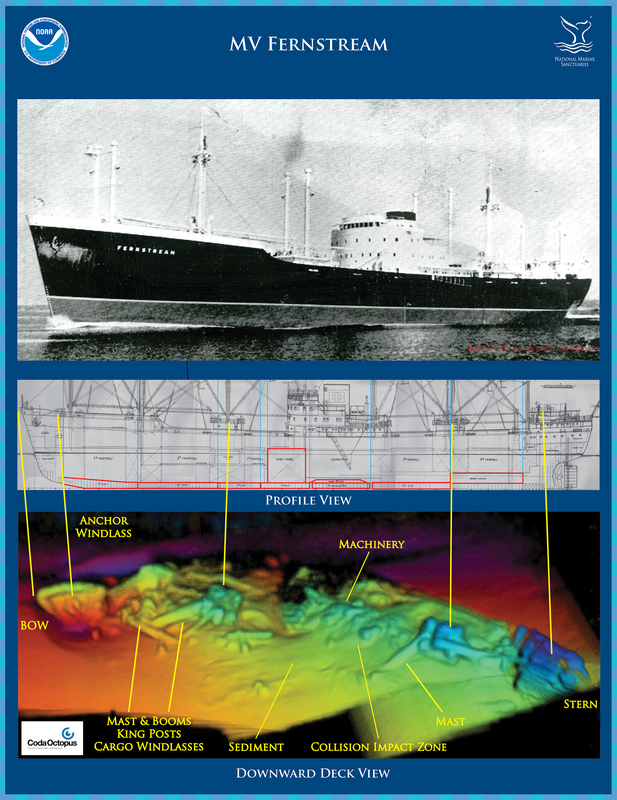 Coda Octopus 3-D Echoscope captured sonar images of the shipwreck MV Fernstream, seen above. Image credit: Coda Octopus/NOAA. 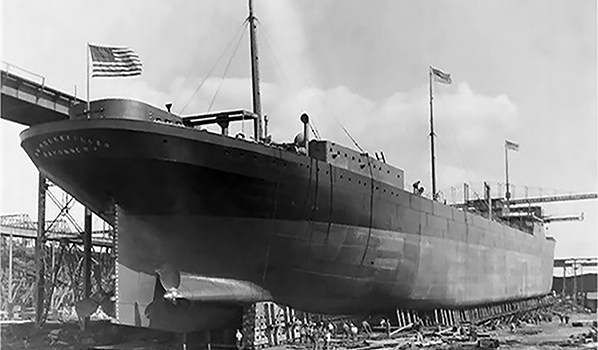 The William Rockefeller under construction. 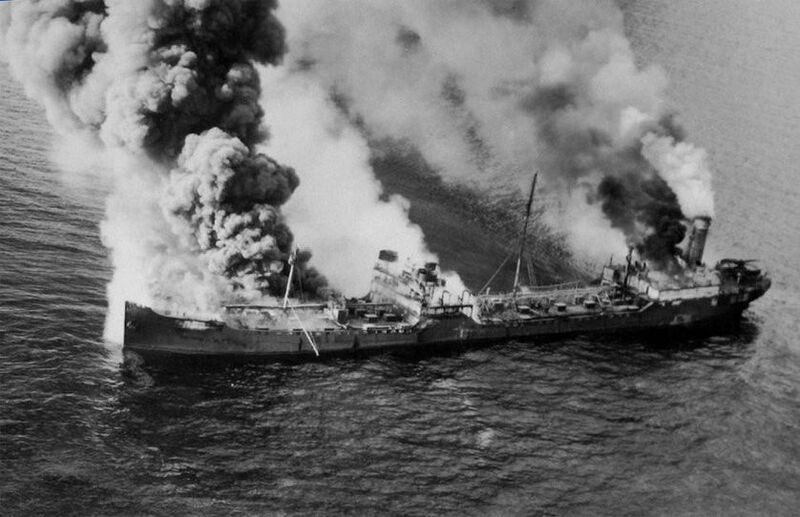 The tanker was torpedoed and sunk during World War II off Cape Hatteras, North Carolina in 1942. Photo courtesy of the Mariners' Museum.